1 of 2 In a large bowl, whisk together yogurt, mayonnaise, lemon juice, curry powder and salt. 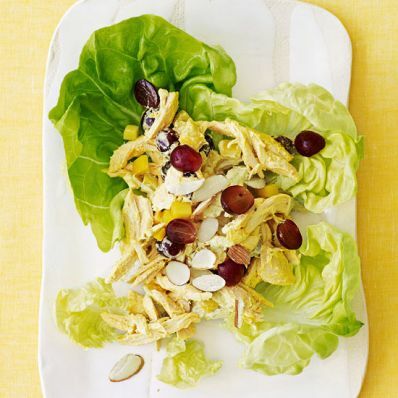 Fold in chicken, mango, grapes and half the almonds. Cover and refrigerate for at least 1 hour. 2 of 2 Line 4 salad plates with lettuce leaves. Equally divide chicken mixture among plates and scatter with remaining nuts. Per Serving: 386 kcal cal., 358 mg sodium, 3 g fiber, 3 g sat. fat, 102 mg chol., 16 g Fat, total, 22 g carb., 40 g pro.